Israeli archaeologists are baffled by a giant cone-shaped structure submerged beneath the waters of the Sea of Galilee. Twice the diameter of Stonehenge and weighing more than ten elephants, a mysterious cone-shaped structure on the bottom of the Sea of Galilee is challenging archaeologists to determine its purpose and age. The mound was first detected in 2003 during a sonar survey of the southwest portion of the sea, rising nearly 32 feet high and about 230 yards in diameter under water. Divers have been down to investigate, confirming that it’s made of basalt boulders and cobbles, many over 3 feet long. According to a report in the latest issue of the International Journal of Nautical Archaeology, the stones don’t conform to a specific pattern of placement, nor do they show signs of cutting or chiseling. Israeli researchers are trying to determine what the estimated 60,000 ton pile of rocks was used for, and who built it. 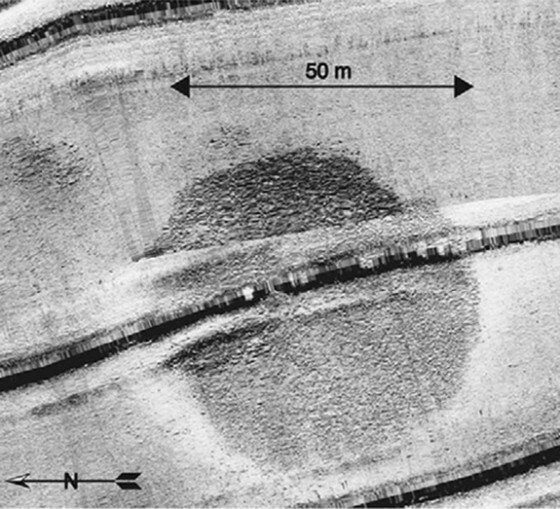 “The shape and composition of the submerged structure does not resemble any natural feature. We therefore conclude that it is man-made and might be termed a cairn,” the researchers write, suggesting that the subaquatic bulge may have marked a burial site. The researchers liken the discovery to other ancient, megalithic structures found near the Sea of Galilee, including the monumental site of Khirbet Beteiha, located 19 miles north-east of their find. That formation is comprised of three concentric stone circles, the largest of which is 184 feet across. Four thousand years ago, that city was, “the most powerful and fortified town in this region and, as a matter of fact, in the whole of Israel,” said researcher Yitzhak Paz, of the Israel Antiquities Authority and Ben-Gurion University. The archaeologists suggest that these long-gone people might’ve had the planning skills and economic ability to organize such a large-scale project. The megalithic structure was most likely built on land, then covered as sea levels rose over the centuries. Archaeologist Raphael Greenberg describes it in a chapter of the book “Daily Life, Materiality, and Complexity in Early Urban Communities of the Southern Levant” (Eisenbrauns, 2011) as being a heavily fortified 74-acre site with up to 5,000 inhabitants. With paved streets and towering defenses its people were clearly well organized. “They also indicate the existence of some kind of municipal authority able to maintain public structures,” Greenberg writes. Paz told LiveScience that a new expedition is being planned to examine the site. That project will focus on finding artifacts and organic material to accurately pinpoint the date of construction. Hello! I just would like to give you a huge thumbs upwards for the wonderful info you have here on this post. I’ll be coming back to your site for more soon. G&M are ‘sons of Adam’ i.e. human beings to be released when a people return to a town which was destroyed & from which they were banned. Some scholars argued this town is Jerusalem. They’ll possess great power & on released will cause corruption in society (Yājūj and Mājūj do great mischief on earth, Al-Kahf verse:94) to such an extent that for each 1 muslim there’ll be 999 of G&M led to hellfire they’re from Noah’s son descendents ‘Japeth’ inhabited in northern areas of Asia. In Qur’an 18:83-98, it’s stated that Dhul-Qarnayn traveled in 3 directions meeting people who complained that G&M were causing corruption on Earth. Qur’an indicates the wall of Zulqarnain’s in the Northerly direction. G&M of babaric humanoid clan will torment the world in its dying days. One of the major signs of Qiyamah. Islam Muslim Qur’an: Prophet Zekhariya 38 describes Gogh & Meghogh as INVADERS of Jerusalem who will join a mixture of other nations in an attack on the Jewish people in Jerusalem. G-d will execute judgement on those attackers & the Jewish people will be restored. Before 1948 this prophecy sounded ridiculous. Today, with Washington, the European Union & the United Nations pressuring Jews not to build in Jerusalem, it sounds very eerie. bottoms to take on water as ballast. It could be some kind of burial mound – and an indication that the lake underwent a significant dry spell back then. When will you find out more ?Please keep me informed.This is very interesting to me.